The Supreme Court on Tuesday refused to grant an interim relief to Karti Chidambaram, son of former Union finance minister P Chidambaram, in the so-called INX Media kickback and money-laundering case and listed the matter to be heard again on 8 March. 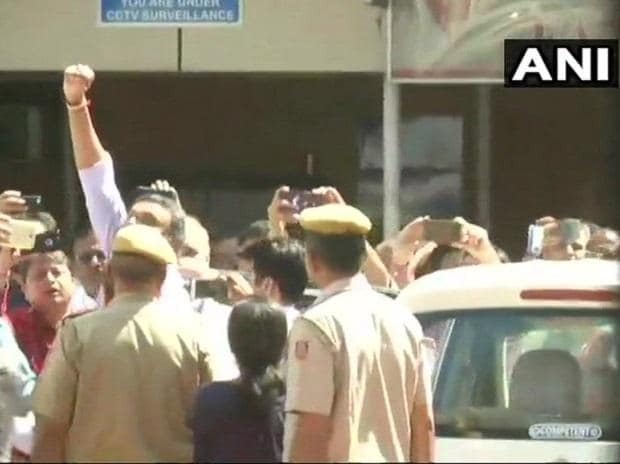 Karti was seen raising his hands and shouting slogans while entering the Patiala House Court on Tuesday, according to Times Now. Congress leader Kapil Sibal and senior lawyer appearing for Karti had pleaded to the top court for interim relief in the case. CBI said that it had been able to gather some important information during the custodial interrogation so far, even as the accused had remained evasive while answering routine questions. The premier investigating agency said that it needed to confront the accused and co-accused and unearth the larger conspiracy involved in the INX Media money-laundering case. Seeking the extension of Karti Chidambaram’s custody, the CBI said that his presence was needed in order to serve ‘some important & specific purposes connected with the completion of investigation’ in the INX Media case. Simply put, the apex court has now refused to prevent Karti’s arrest by the Enforcement Directorate (ED), even as his custody with the CBI ends on Tuesday. The CBI, however, told SC that it would seek an extension of Karti Chidambaram’s custody before the trial court in the corruption case. Karti had been arrested last week for allegedly influencing the Foreign Investment Promotion Board (FIPB) decisions to favour certain companies during his father P Chidambaram’s tenure as the finance minister. The FIPB has since been scrapped by the Narendra Modi-led present Union government. During its time, it used to be headed by the Secretary of the Department of Economic Affairs with representatives from a host of other ministries. “More skeletons in the United Progressive Alliance governments’ closet” might tumble out as finance ministry officials are reportedly in the Enforcement Directorate’s (ED’s) dock over the INX Media money-laundering case.